Hello Loi, You have achieved another miracle with your new house. I wish you and Tom a very pleasant Holiday season enjoying it. 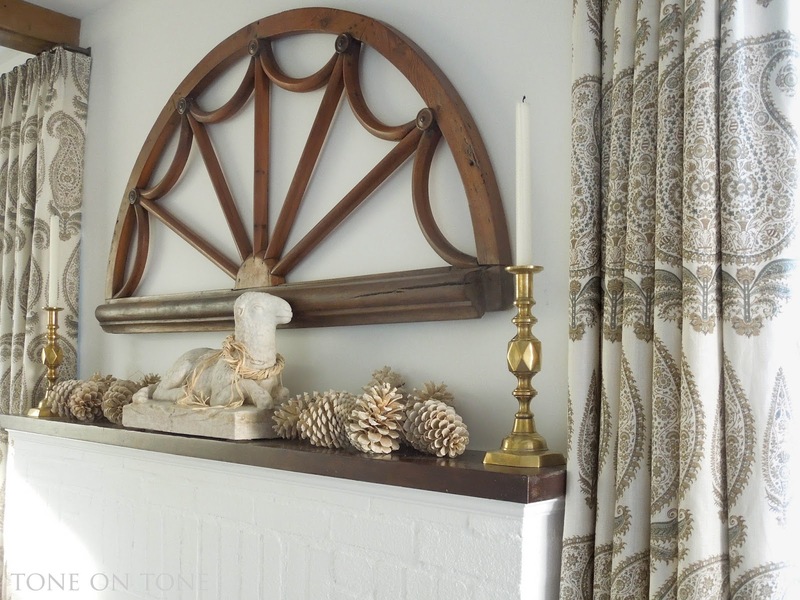 My favorite piece here is the wooden fanlight--I love architectural antiques. My Chinese ones are mostly packed away, but if I ever return to Ohio, I have no idea how I am going to display them. I love the fir tree. I love how you are able to see all of the ornaments. Your dining room is gorgeous. Happy Holidays. 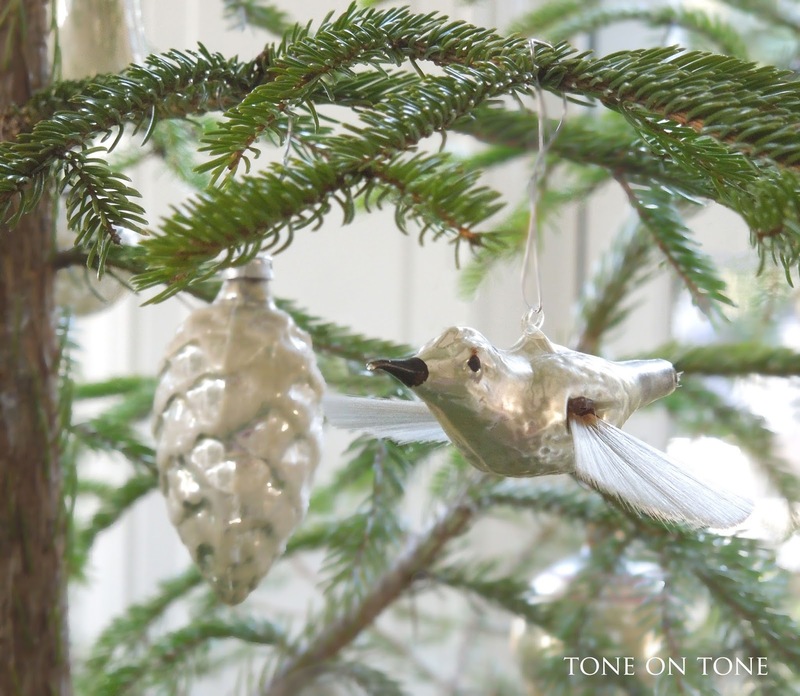 We love seeing our vintage ornaments, too. Thanks, Ron. Merry Merry!! Oh, Loi - your home is so classically beautiful. I love how you have made it shine and feel special without making it feel overdone or busy. You are a true master - love everything you put your hand to! 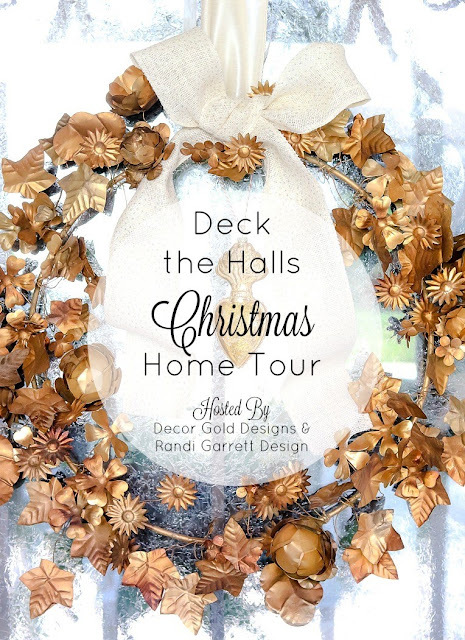 Kathleen, it was a treat joining you on this holiday house tour. Keep it festive and fabulous! So beautiful! That was quick! Love the brass! Merry Christmas! Your home looks perfect, Love all your treasures that are at home in their new places. Enjoy each and every day in your new home. so gorgeous! i love all of the natural touches- the garland, the bleached pinecones, and your tree! Thanks so much, Cassie. Jingle, Jingle!! I love the tree! What a lovely, inviting room. Enjoy the holidays in Maine...with lots of snow maybe?? Perfection! 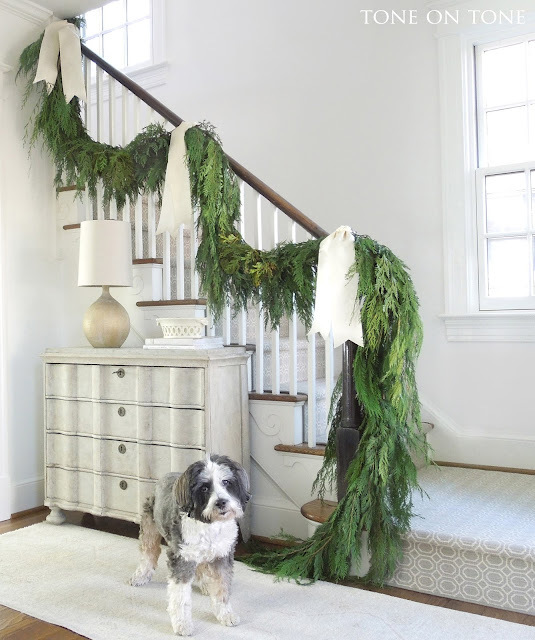 I admire your clean and spare aesthetic, warmed up with antiques, textiles, and strategic hits of color...and cute pup! I've been eagerly awaiting a peek inside your Tudor. It's absolutely charming. I always love your style and the detail touches you make to each room. Merry Christmas to you, Tom and Mocha! Oh my Loi! 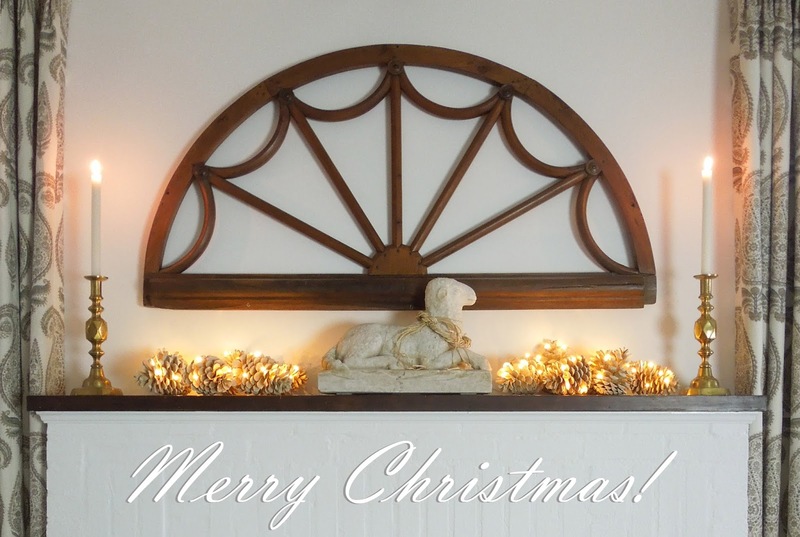 You and Tom have done such a gorgeous job on the house and the Christmas decor. Next year I am following your lead!. I LOVE the garland on the staircase...did you bring that back from Maine too. I found a faux "Charlie Brown" tree and considering getting that as I am unable to find one here.. I love how you did a multi-purpose room of the dining room and library..great idea! I am now so curious and looking forward to your other great news! Merry Christmas to you and Tom and sweet Mocha....Really hope to see you soon!!! Again, your home is breathtaking as always!!! Thank you, Franki! I always love hearing from you. Thanks for all of your comments over the years - means so much to me. Happy Holidays. You home is always beautifully appointed and this year is no exception. Merry Christmas to you and Tom!! Hi Kathysue - I need to catch up with you and see all of the beautiful details at your new home. Cheers! I love your paired down decor with the lovely natural touches. That garland with the giant silk ties...gorgous!! Happy Holidays to you Tom and the pooches! dear loi, i will consider this your christmas gift to us, your devoted followers. 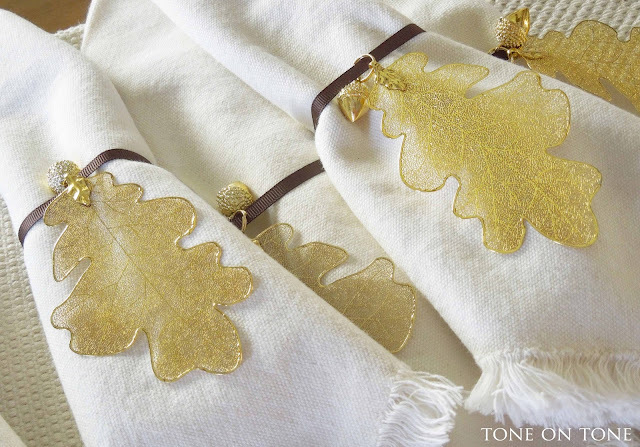 sharing your lovely home and holiday decor is an immeasurable treat. now i am headed back up to linger over your image. merry christmas dear loi and tom!! Dear Loi, hello and happy holidays! Wonderful to see your cozy Tudor cottage here. Your light and white walls are perfect to showcase your natural elements that I love so much. 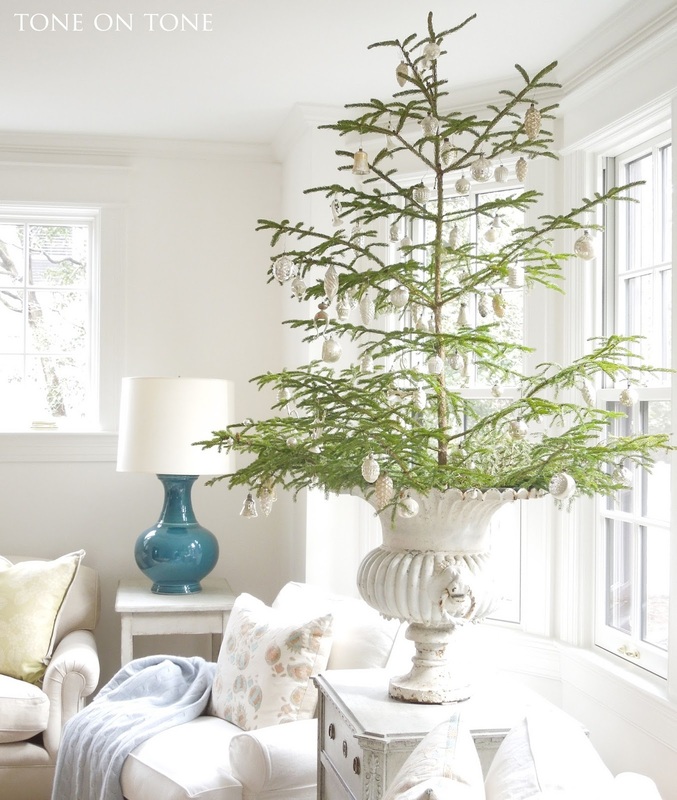 That tree....my absolute favorite type of tree that allows pretty and simple vintage ornaments to glow. And it's wonderful to see you again! I hope to see outside photos of this home soon! Much love to you and Tom. Anita - Your Instagram photos have inspired me so much this year. I love, love all of the Tudor homes you've shared. Merry Christmas. Lovely and festive as always, Loi! You put us all of us late decorators to shame and we hope to get ours done this weekend. Hope you're staying cozy and warm! Love your Maine tree! 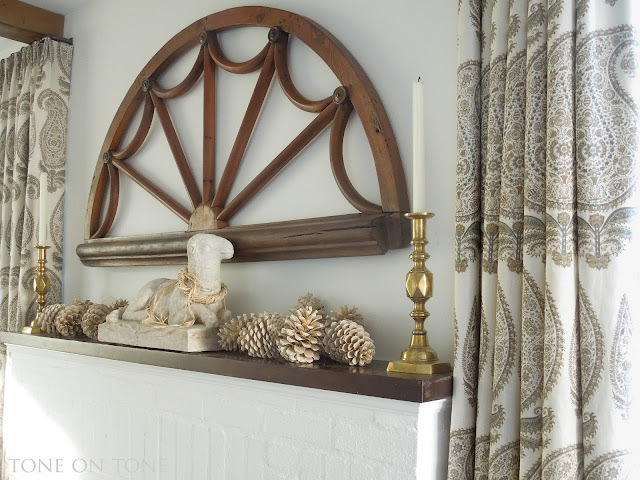 I like the openness that shows all the delicate antique ornaments. Well done! 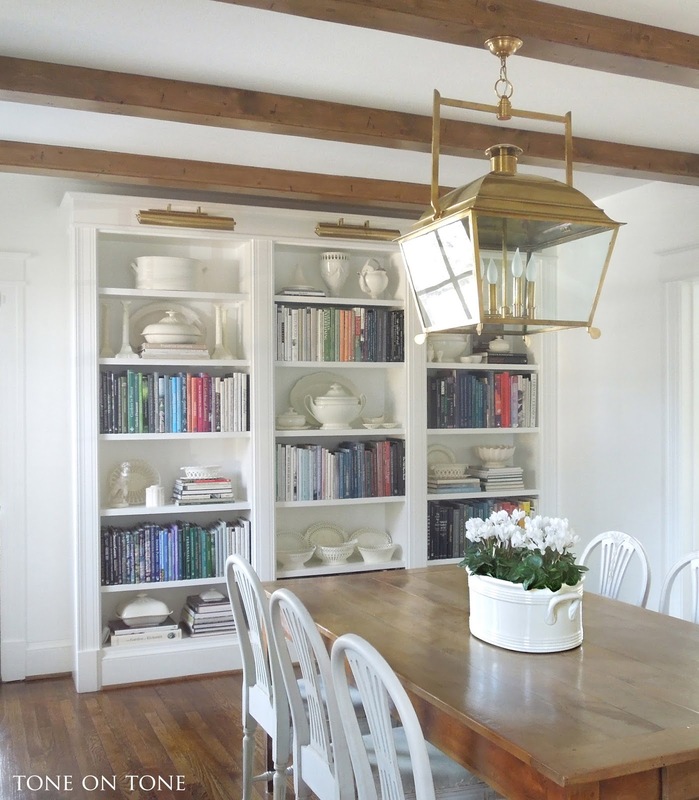 The wall of bookcases filled with art books and white ironstone makes a beautiful statement. Perfect choice for dual purpose with a dining room. All the best for happy holidays to you and Tom and sweet Mocha. Loi, I hope that you are staying warm! It is 21 down here, hopefully it will only last a few days! I love your little tree! How beautiful! Your house looks festive, relaxing and beautiful. I hope that you have a wonderful and happy Christmas! amei tua casa, está linda. Positively stunning! Mocha is so darn cute. Have a great weekend! Loi it is lovely! 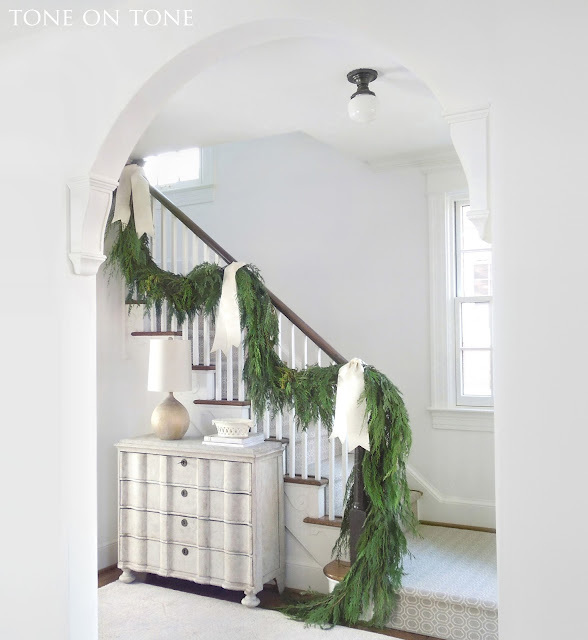 I loved your garland on the staircase, its so lush and the white floppy ribbons look elegant. 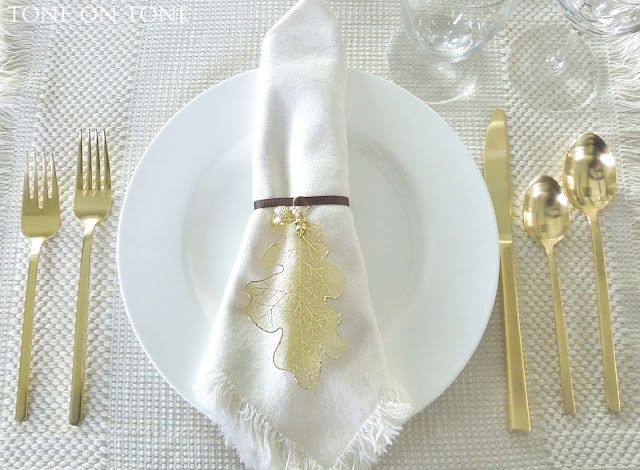 Love how you used the sheer gold leaves on ribbons as napkin holders. Just may do my own version of this! So beautiful, Loi! 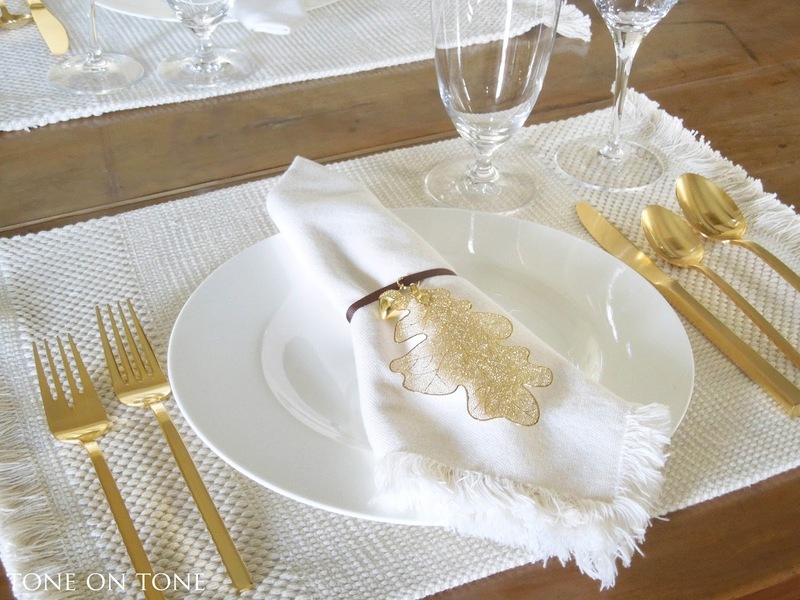 Love your table setting and gorgeous curtains...and everything else. Merry Christmas! Your home is so beautiful, Loi! It looks especially cozy and welcoming decked out for the holidays! I hope you have a wonderful weekend! Loi, your home is warm and inviting and I appreciate the restrained touches of decor. It doesn't take much to get in the "festive" mood when admiring your tasteful and sentimental displays! Happy and a healthy Holiday to you, Tom, and that cute Mocha! Ooh Loi, that was such a treat! I could stare at your rooms for hours! Merry Chrismas! Who would want to célébrante thé holiday here with you, it's truel breathtaking, I love the Garland loosely draped and again I can say enough about your tree, it's my favorite, And the frosted foiled ornaments delight the Christmas spirit. To you and Tom a peaceful all is calm Christmas holiday. Loi, everything looks beautiful. Your home is so welcoming and warm, yet so peaceful and serene. The garland is stunning. 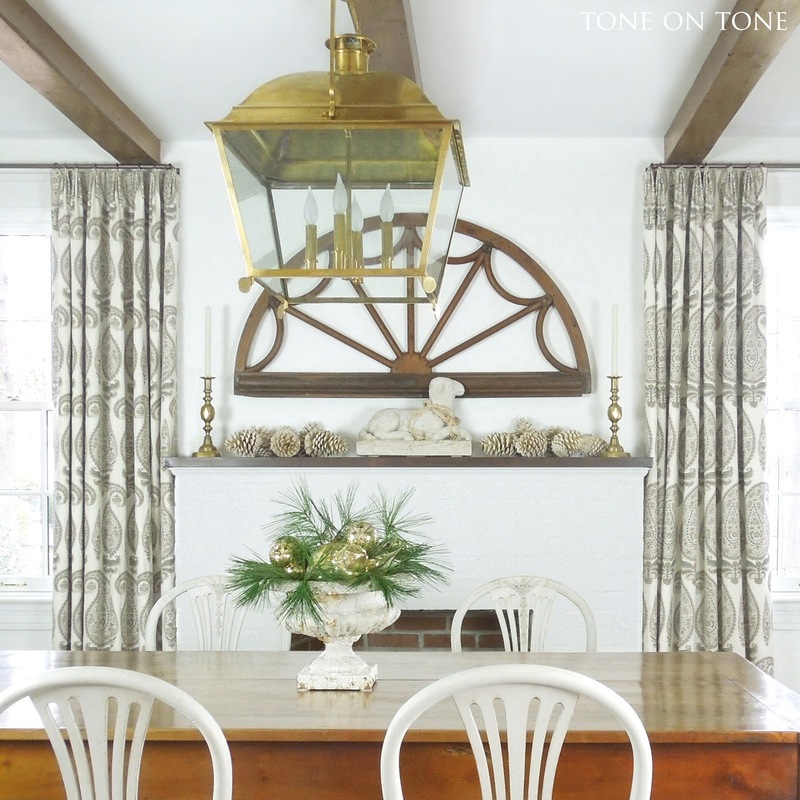 I admire your dining room space / library, it's perfect! Wishing you and your Tom a beautiful holiday there, with all those you love! Thanks very much, Vesna. Merry Christmas to you and yours! Loi! Your home is stunning. 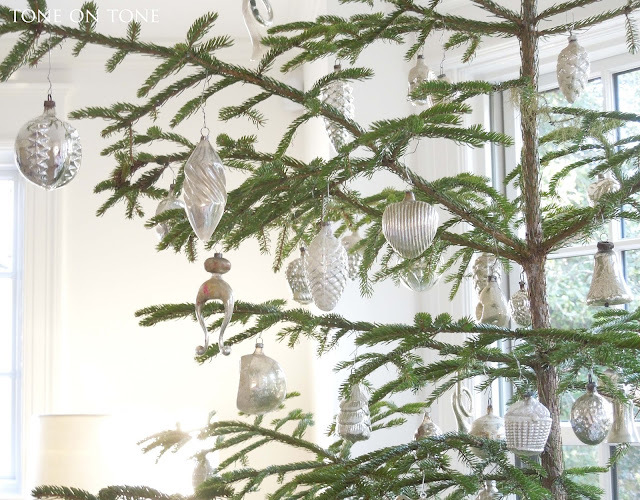 I love that you have a piece of Maine with you - that tree is perfect filled with those beautiful ornaments. 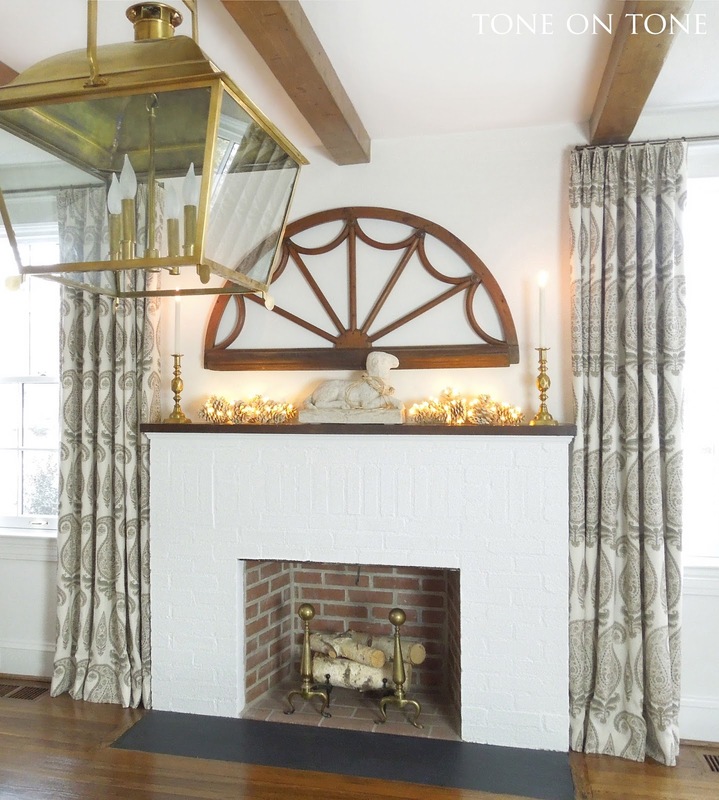 I love your understated mantel too and the staircase! Santa is putting you on the nice list. Sushi sends hugs to Mocha - Merry Christmas! Your home is so beautiful - truly inspiring! I especially love the spareness of the "Charlie Brown" tree. And the vintage ornaments are simply stunning. Wonderful tour! It all looks perfect from the first step inside...Mocha is the perfect greeter! Love seeing your tree and the dining room with the gold flatware is gorgeous. Wishing you and Tom a wonderful holiday season! Gorgeous. Gorgeous. Love the Christmas tree and those paisley curtains made me faint! You can do no wrong:) Merry Christmas y'all! Gorg! 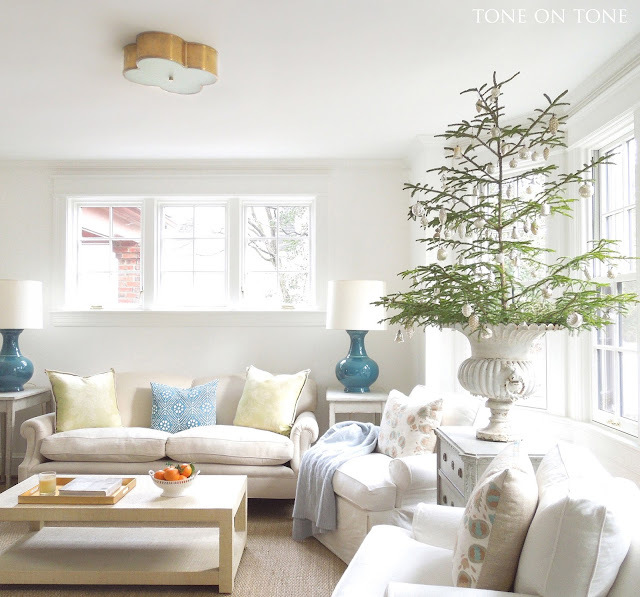 I love how simple the tree is and all the white decor. I went for a similar look for my place using Furnishr.com as always. I think their service is amazing. The place setting is so cute, I definitely got some inspiration for this year's Christmas decor!